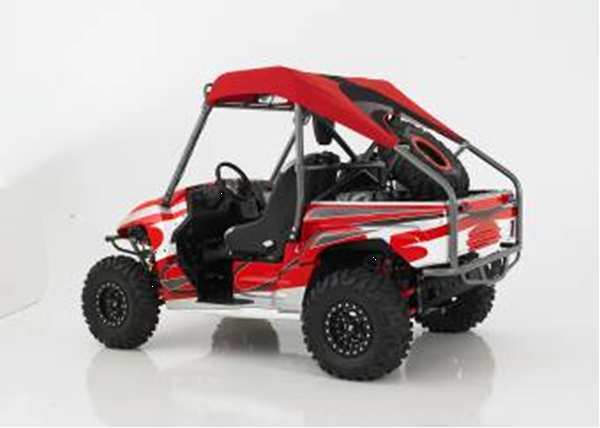 Radios and intercoms for your Rhino or RZR. Also available are reliable off-road GPS systems. Fire Extinguisher Mount is a safe, secure way to mount 1lb. & 2.5lb. fire extinguishers to rollbar or other area. Transfer a 5 gallon container of gas in less than 1 � min, without any dripping. Bolts into factory mounts. Driver or Passenger side. The headrest cover fits over the Rhino factory headrest. The seats will fit with Yamaha factory seat belt set up. It is guaranteed not to leak and includes four strap hole fasteners on each corner so the cooler can be strapped down to the rack of your off-road vehicle. The new outer material is 1000 denier vinyl and UV protective so the color won't fade in the hot sun. Not only is it stronger than any other soft-sided cooler, being tear resistant up to 375 pounds, but is also waterproof and anti-mildew. This new cooler is a must for any off-roaders wanting a cold drink. It's the STRONGEST COOLER on the market!